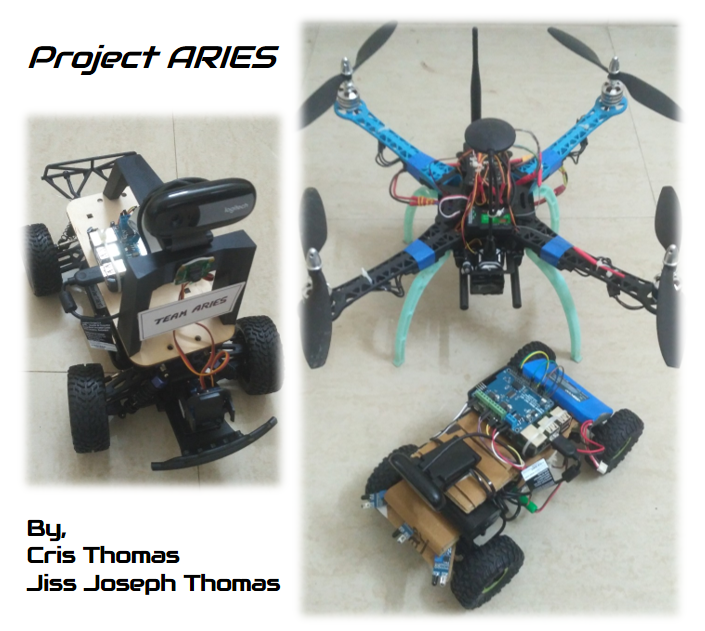 I humbly take this opportunity to share our work in progress on the project ARIES a.k.a Autonomous Response using Intelligence for Emergency Scenarios which is currently in development as part of the Hackster Autonomous Robot Challenge. Our team Deodates constitute me and my brother Jiss. I specialize in the hardware and integration while he specializes in the software and testing. The aim of this project is to develop a system of intelligent and connected autonomous vehicles to support in emergency scenarios and provide immediate response to the situation. In Uttarakhand, Nepal and most recently in Kerala (India), floods have caused a lot of devastation resulting in a tremendous damage to person and property. Due to the accumulated heap of landmass spread over a large area after the flood, it was difficult to carry out the search and rescue operations or navigate manually. This led to numerous loss of lives due to the unavailability of emergency support. Another recent incident that occurred in Thailand has caused 13 people being trapped in a cave. With the increase in the rate of natural and manmade calamities, we need to recheck our ability to perform an emergency response operation without any delay. This motivated us to develop a solution to overcome situations like these in the future. With the help of latest technology, it is now possible to reduce the delay in response required to provide help and support to an emergency scenario such as a disaster, calamity or an incident. It drastically reduces the amount of workforce required for carrying out highly sophisticated tasks. Using a connected autonomous system consisting of aerial (Drone) and ground vehicles (Donkey car), a scene can be monitored in real time and instant support can be provided. Let me summarize the end goals for this project. We will be sharing further details of this project and its progress as it happens. Our team Deodates have won the "Greatest Social Impact Prize" at The Autonomous Robot Challenge 2018 powered by Hackster and ARM. We thank all our supporters, especially the feedbacks, encouragement and guidance. We also thank Hackster and ARM for giving us an oppertunity to participaye in this awsome contest. We also thank Ella from Hackster, Allessandro from ARM and Ramon from PX4 for their support and advice. Change the world with low-cost autonomous robots built on Arm! With Arm. A system of intelligent and connected autonomous vehicles to support in emergency scenarios and provide immediate response to the situation. By Cris Thomas and Jiss Joseph Thomas. Congrats @crisdeodates! Great project - what's next for the team? How do you envision the commercialization path for your technology?